From the developer of SokuleSubmit, 1Click Marketing Machine, KulePing, Sokule and Yakamore comes a brand new submitter KuleSubmitPro. * You don't need any experience. * You don't your own website or domain. You can submit any site at all using KuleSubmitPro. 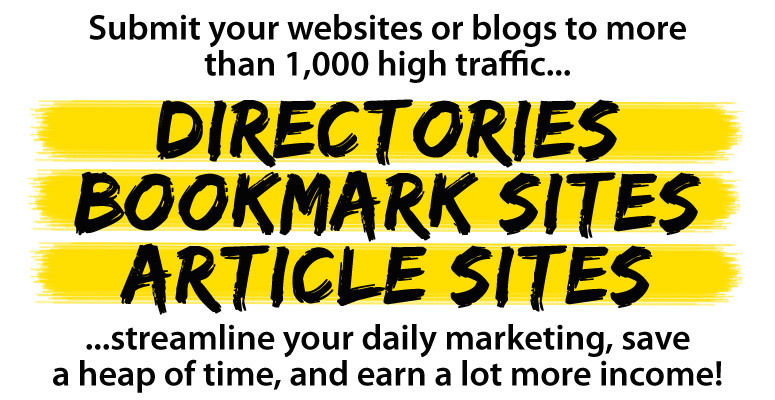 Start submitting right now to more than 1,000 high traffic sites today. 1. Signup free, click the link in the confirmation email we send you, login to your account and purchase submission credits as you need them. 2. Signup free and take advantage of our special OTO offer when you see it. It is part of the signup process. You will not see this discount in the members area so you need to snap it up when you see it. We put you in complete control! You can purchase as many, or as few, submission credits as you wish and you can use all submitters or just those you want to. Your best choice is to select one of the offers you will see as you signup. These will give you a lot of submissions and save you a great deal of money.